Evening folks. It’s been a while since our last post. So what’s happening? Next weekend we have a table at Sci Fi Scarborough which promises to be an awesome amount of fun!! Check out the website and get there if you can. 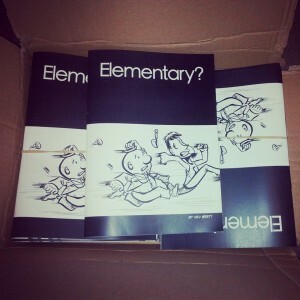 And just in time for the conference we have the printed version of Elementary?, after which we’ll put whatever we have left in the shop right here!! I’ve (Kev) also been working on various new comic projects, including a short story that I’ve illustrated for the awesome guys at Haylestorm Comics. I can’t divulge too much info but when the book becomes available I’ll let you know. We’ve also unveiled the new Nottingham Comic Con website and already (within a week) we’ve had over half the tables booked. Check out the new site and we look forward to bringing you more news on this year’s con!